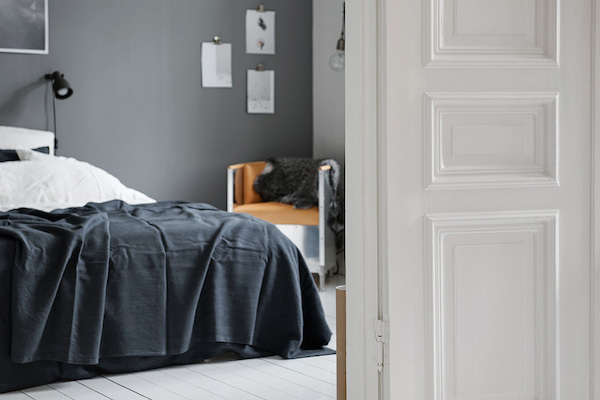 my scandinavian home: Duvet day in this monochrome bedroom? 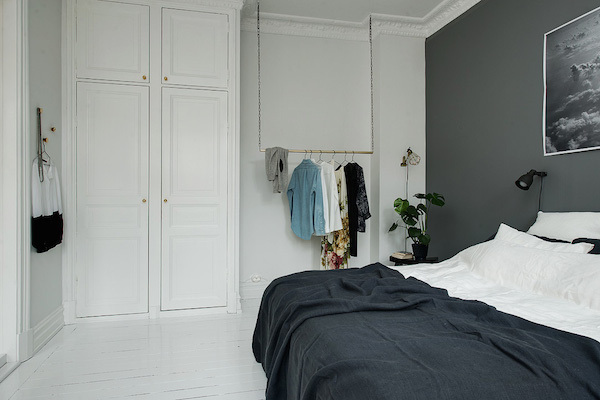 Duvet day in this monochrome bedroom? Hello! I must say it's great to be back at my desk this morning after the madness of a three day photo shoot (I do have some lovely memories though- like this incredible view down to a Danish beach - Denmark is just stunning). I'd also love to have a duvet day and still be snuggling up in bed, I'm so tired! Which is probably why I was drawn to this incredible bedroom today! It has everything I could possibly need - calm dark grey and white colour scheme, soft linen bedding, open and closed storage (I love these), a work corner bathed in sunlight and a stack of magazines. Oh yes, transport me there now! Could you take a duvet day here? I would sleep so well in this room, how about you?! Zzzzzzzz. A few items I know and love: Hektar reading lamps, white linen bedding. I like this moss knit throw. HAY light, this clothes rail is similar, String shelving system. I like these hooks. Try Farrow & Ball Down Pipe for a similar dark grey wall and I recently painted my floor in Strong White, which comes out a beautiful pale grey. Other bedroom's I would sleep easy in include Holly Marder's lovely space in neutrals and Tine K's calm Danish room. I'd also quite like a night here, how about you?! You can see my complete archive of bedrooms here (scroll down past the first one as it it will be the one in this post)- warning, it might make you feel like you want to go back to bed (or at least revamp your entire boudoir!). 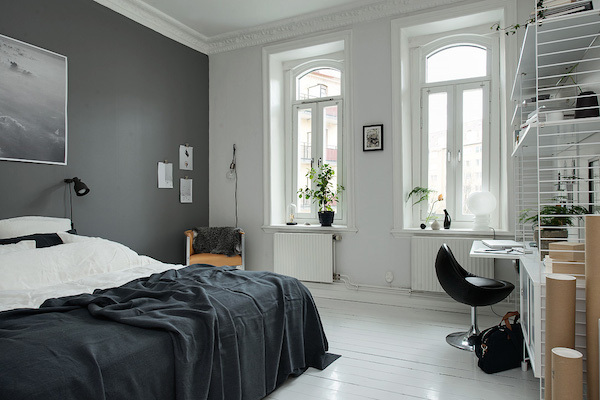 More lovely white and grey home inspiration here (Swedish) and here (Finnish).